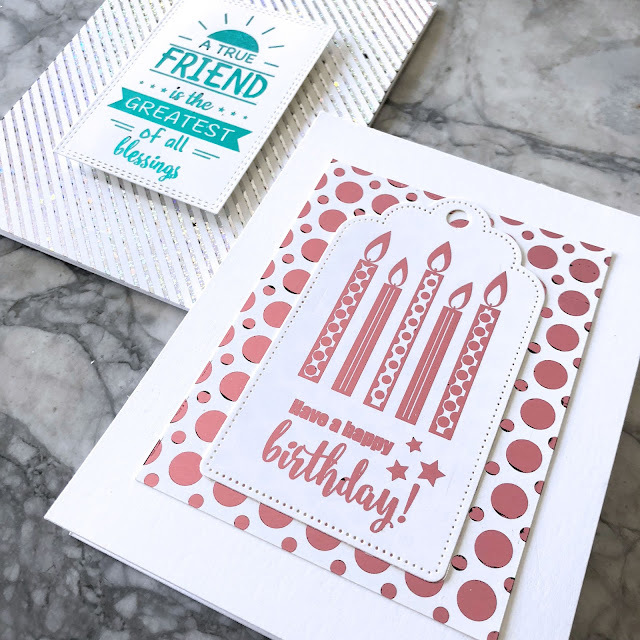 Foiling and cardmaking go hand-in-hand - it is the perfect technique for your cards to add shine and elegance, or maybe a little fun! This week, I am taking you through 5 days of video tutorials showing off different techniques that you can do with foil. I am collaborating with the fabulous Laurel Beard so be sure to subscribe to her channel, check out her blog and watch her video! Today we are looking at basic foiling techniques. 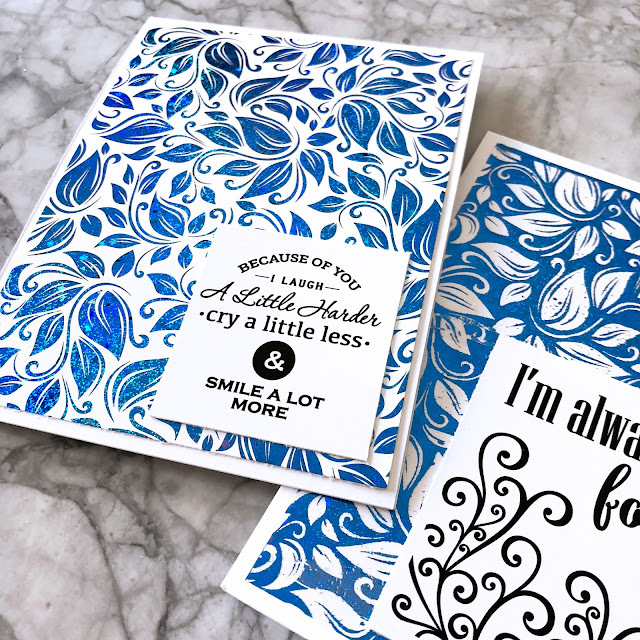 If you have your own laser printer, you can actually print your own designs and sentiments to use (see this video for more information)! 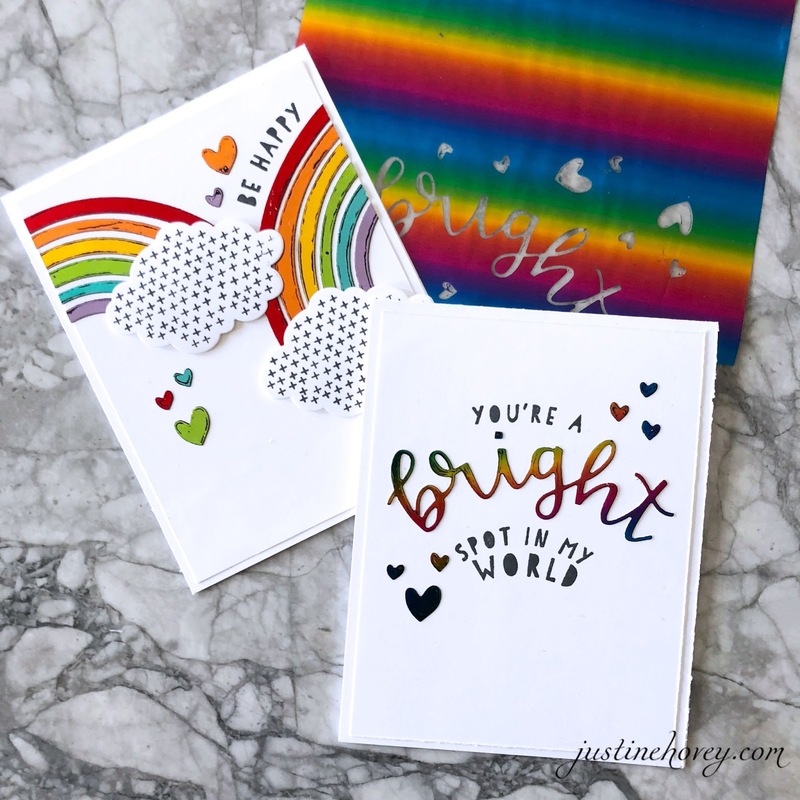 Since I don't have one of those, I'm going to show you how to foil using pre-printed sheets (Foil-Mates), how to use toner sheets so you can foil your dies, how to use the negative pieces and how to make monochromatic and multi-coloured foiled cards. 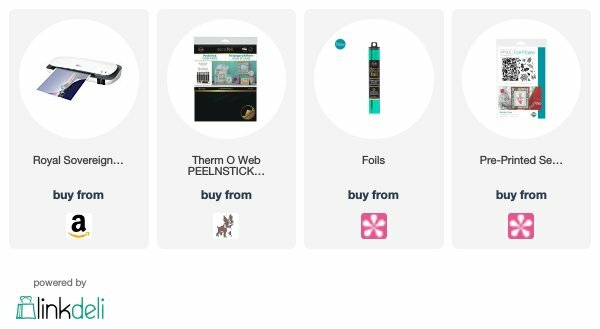 For quick, easy, ready-in-minutes cards, I recommend the very simple technique of selecting a Foil-Mates background and sentiment. you just simply cut them down to the size you need, add them to a folded piece of parchment paper, add foil (colour side up!) and run it through a laminator. Once you peel off the foil, you can use the negative piece (card on right) as another background for no waste! You can stick with one colour or mix and match colours to create a variety of looks! I cut the sentiments out using the coordinating dies that coordinate with all of Gina K's Foil-Mates sentiments! You can mix and match your own dies as well to create using Toner sheets. I recommend foiling the toner sheet and then die cutting in order to avoid those black spots on the die where the paper was pressed down. For this card I used multiple colours of foil and the Concord and 9th Rainbow Wishes Bundle. Foils: Rainbow, Red Velvet, Sweet Mango, Wild Dandelion, Grass Green, Turquoise Sea and Wild Lilac. I can't wait to see this series. Wonderful cards. 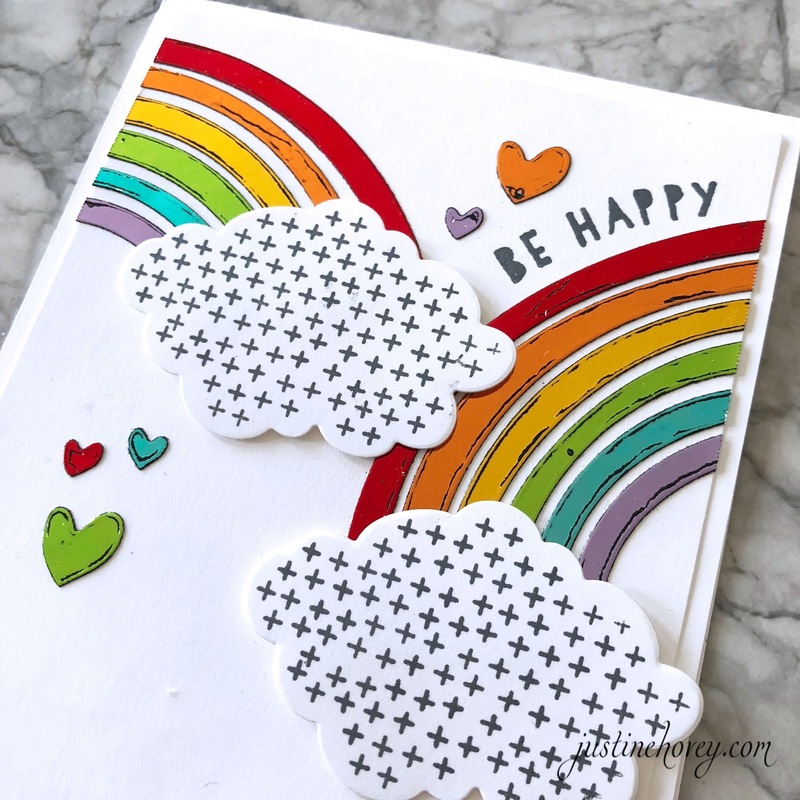 Such a pretty but simple way to add color to your cards! Thank you for sharing this series!! Beautiful cards Justine! I love the look of foiling. 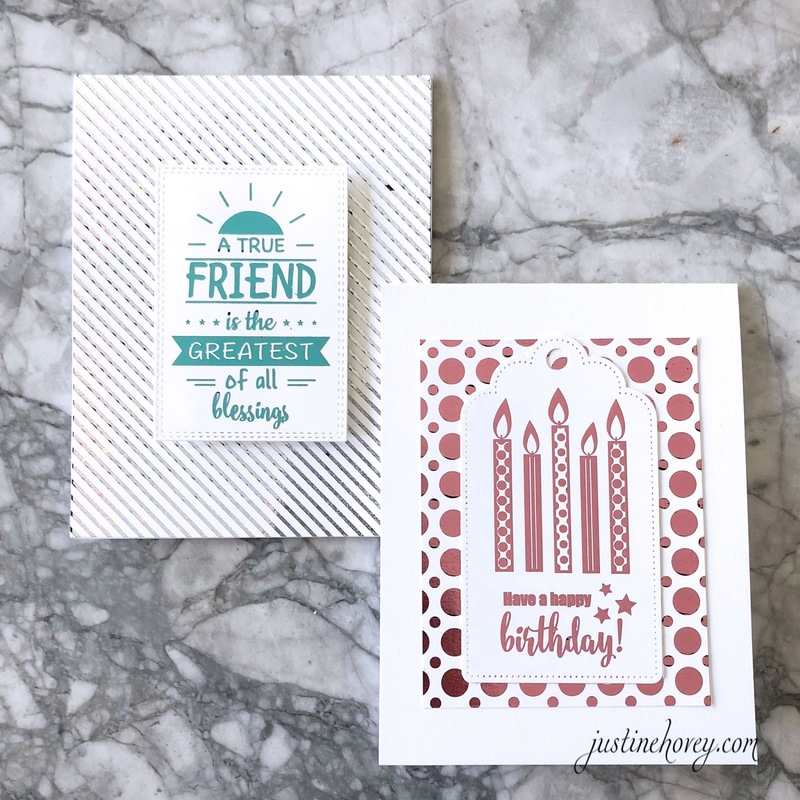 Love these cards Justine! Thanks for the video!! Foiling is a super easy way to add shie to cards. Thank you for sharing. Very pretty cards. I love the foiled look and they have so many pretty ones now. All of the cards turned out fantastic....I really love the first blue foil card. Love FOIL! The cards are elegant, bright and fun all at the same time. Looking forward to the rest of the series. Thanks. These cards are so pretty and fun! You never fail to inspire me. Gorgeous cards and I love the Gina K design sheets, I will have to check if they are available over here in the UK. what a fun series you and Laurel are presenting this week - love your examples and all the good info - looking forward to a great week of videos. Beautiful cards. Thanks for sharing. Looking forward to tomorrows video. Love these!!! I have foiling supplies but keep forgetting to test my current (and old) laminator. I know once I sit down to do it I'll either run out to buy a new one so I can finally foil, or spend the whole day foiling my heart out. I think that's why I haven't done it yet... I haven't had a day to dedicate to it! But I want to!!!! Beautiful! I just received some foil and your tips and ideas are perfect! I love your cards. Always so beautiful. I can't wait to try foiling - thanks for this series. All these ideas . Thank you. These cards are so pretty. I have got to try this. Fantastic cards! I love the shine and vibrant color from the foil. 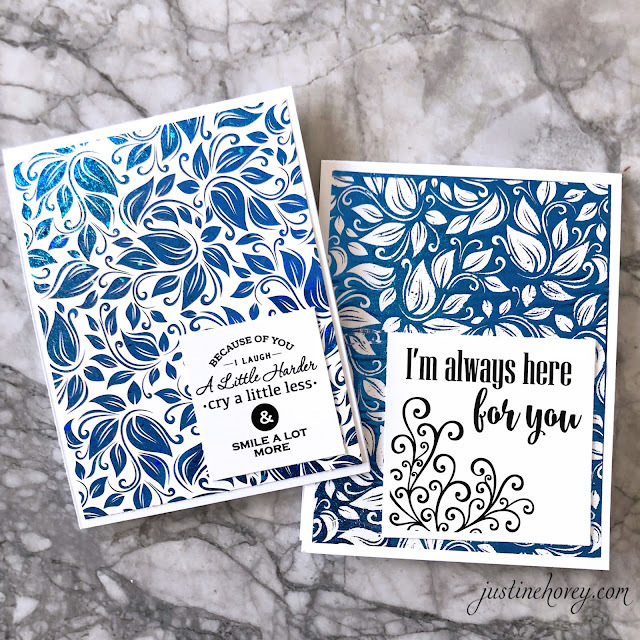 The positive and negative blue floral cards are amazing. Love the cards you created, Justine. I love the shine that foil adds to cards - just that little something extra. Looking forward to the rest of the series.